A Study Tour participant from Uppsala in Sweden just uploaded this video shot two years ago during the school run in Assen. This is an area within a suburb of Assen near local shops built between primary schools (age 5-11). The same thing happens every day. Parents accompany many younger children, but you'll note that almost all children of all age groups ride their own bicycles and that older primary school age children are independently mobile. Also note that cycling is always a sociable side-by-side activity. If cycle-paths were so narrow that they enforced one-by-one cycling then they would neither have the required capacity for this many cyclists nor would they be useful for parents accompanying their children. See this for yourself: Book a study tour. Probably amongst the cutest things you'll see this week, this video from our local TV news is of the BMX national championships for walking bikes held in the town of Klazienaveen in Drenthe. There were four different categories: 5 year olds, 4 year olds, 3 year olds and 2 years or younger. 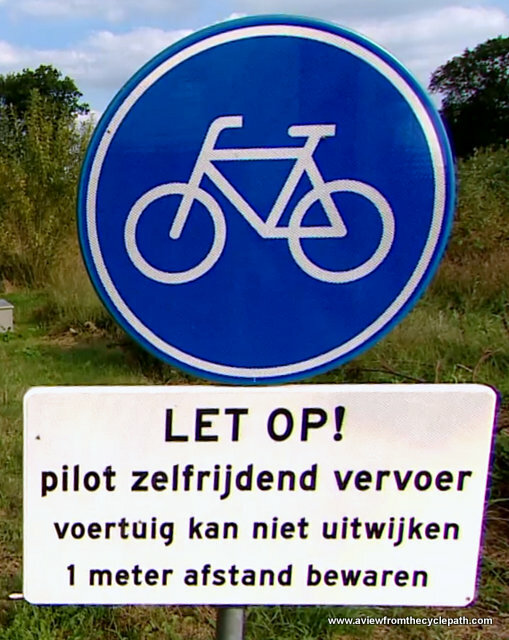 At the moment, our local TV station has a series of programmes entitled "Week van de fiets". This was the first installment, in which people are interviewed about their cycling habits. Drenthe has more segregated cycle-paths than any other province in the Netherlands and this is part of the reason why Drenthe is one of only two "five star" cycling provinces in the country (the other is Friesland). Unfortunately, being a five star cycling province doesn't necessarily mean that local councillors appreciate what they have or that policies are particularly sensible. 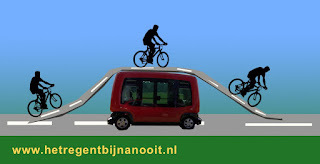 Just over the border in Appelscha (that's in Friesland but supported in part by a grant from Drenthe) there has been a trial of a self-driving bus along a cycle-path. 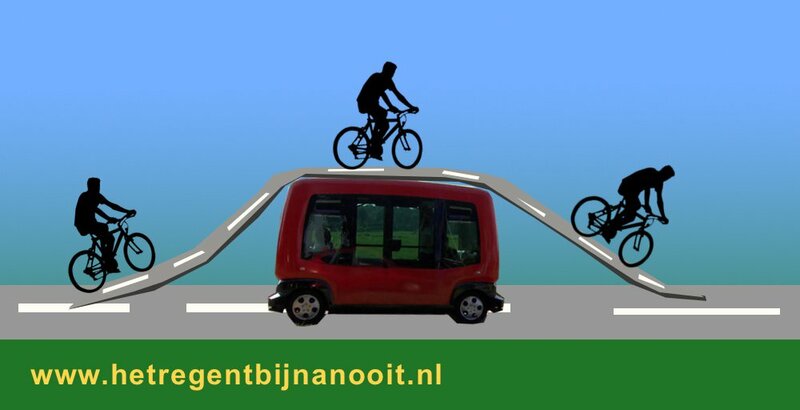 The bus travels at a maximum of 15 km/h and is as wide as the cycle-path on which it travels. Result: perhaps not much actual danger, but plenty of unwelcome chaos. Cyclists are told they have to swerve because the bus cannot. People who have been interviewed after riding the bus say that it's only useable if you've got all day to make your journey. Note how the seats in the bus are three abreast. Even in the Netherlands, every other mode of transport is always given width to enable sociable travel, even if as in this case that means that due to a bus entirely filling the cycle-path, the legitimate users of the path are forced to ride on the grass ! I very much hope we've seen the end of this ridiculous trial. There are many bus roads in the Netherlands along which buses have right of way and those, as well as normal roads, are where buses belong. Update: I'd barely posted this before I read that these buses will return next week. Apparently, actual people are to be employed to stand along the cycle-path and instruct cyclists on how to avoid the bus without a driver which is filling their cycle-path. This is beginning to sound like some sort of comedy skit. 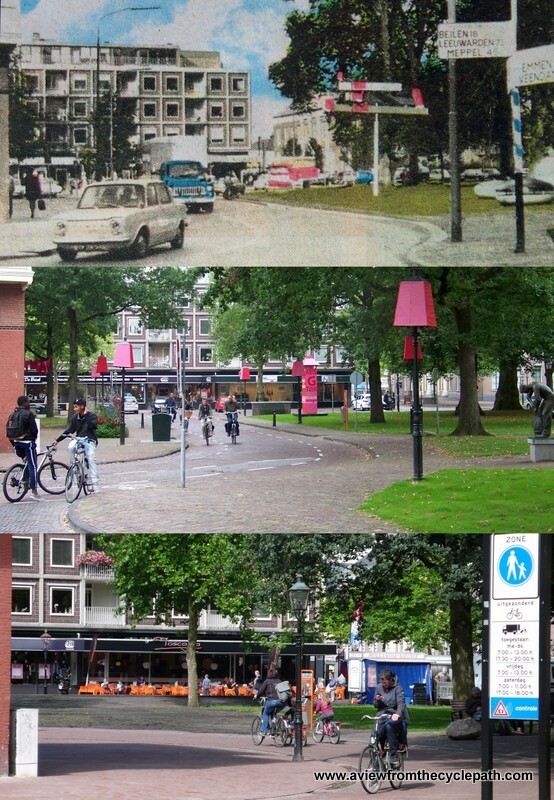 Changes in Assen 1960/2014/2016. More. Finally some welcome news from Assen. 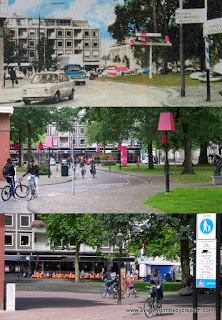 A few weeks ago I updated a page of before and after photos of Assen to include the new situation on the Brink. Over time, this area of the city has changed from a busy through route to a rather quiet street and as of a few weeks ago in 2016 it has been a pedestrian zone in which cycling is permitted. The news item warns that the promised electronic detection of motor vehicles driving through this area will be switched on soon. From the 1st of October, motorists using this area will receive a written warning. After the 1st of November they'll receive a €90 fine. 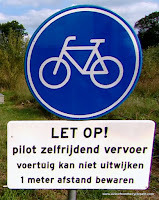 The Netherlands is actually a very easy country in which to be a driver, but you can't drive a car everywhere because this limits the options of other people. If Assen's city centre streets had been allowed to continue to fill with cars, then the streets would be even more chaotic than they were in the 1970s and this city really would not be the pleasant place it is today. Not all recent developments are good, but the overall we are still heading in the right direction. Need good quality reliable bicycle components ? Don't forget our webshop. That's what pays for the blog.